Despite having had the DIY Dog book of BrewDog's recipes for a while, I've never taken the time to make one of their beers. I decided to change that today, selecting the "IPA is Dead" Mandarina IPA since I had plenty of Mandarina Bavaria hops and (what I thought was) enough Maris Otter malt. As it turned out, I was a little shy on the Maris Otter and had to fill in with some Belgian Pale Ale malt I wanted to use up. The mash schedule is the PicoBrew High Efficiency Mash Schedule, modified so that the main mash step is 75 minutes at 149F per the Brew Dog recipe. Fermentis says the ideal range for the US-05 yeast is 64-82F. Since I'll be pitching a full packet of US-05 into a 2.5 gallon batch, I do not plan to rehydrate the yeast or create a starter. There should be plenty of viable yeast without doing that. My plan is to hold the beer at 68F, near the lower end of the range, until fermentation is complete. After that, I'll treat with gelatin and cold-crash to brighten the beer before bottling. I'll be aiming for medium carbonation at bottling. 09/29/2018: The addition of Belgian Pale Ale malt was a last-minute choice since I was about a pound short of Maris Otter. I chose the Belgian malt because it was closer to something BrewDog might have used in Scotland than a domestic 2-row. 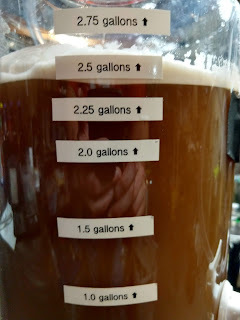 The PicoBrew recipe crafter recommended 3.22 gallons of staring water, but I decided to go with 3 gallons plus approximately 40 ounces because it seems that in a high-efficiency mash they are sometimes a little short and this causes foaming. It looked like this starting water amount was about all the machine could hold. I didn't see any overflow but it certainly filled the step filter to its absolute limit. Gravity came up about 10 points low on this batch, possibly due to the thinner mash. However, volume also came up low, so that implies a fairly low overall efficiency. One consequence of this is that the beer is likely to seem more bitter than it would have if I'd hit the gravity target. For an IPA that isn't a concern, but for some other styles it could make a big difference. The wort came out of the chiller at about 84F, so I let the temperature control system get to work before pitching the yeast or Clarity Ferm. Around midnight the temperature had dropped to a range where it seemed appropriate to add the yeast. During cleaning, it was clear that wort had overflowed from the mash compartment and carried some kernels of grain into the boil chamber. Given past experience, I don't expect this to create an unpleasant level of tannins in the finished beer as the amount was fairly small. 09/30/2018: It's about 17 hours since the yeast was pitched. Temperature has held at 67F. Gravity has dropped from 1.056 SG down to 1.054 SG, so there is clearly some fermentation going on. If I don't see a significant improvement by Monday evening, I'll pitch another packet of yeast. 10/01/2018: It's approximately 41 hours after pitching. The temperature has held at 67F. The gravity has dropped to 1.043 SG, which is about 23% attenuation. The fermentation has been slower than I've often seen US-05 work, probably because the temperature is being held low in the yeast's range. It will be interesting to see where things are tomorrow. 10/02/2018: The gravity is down to 1.028 SG as of this writing. That's about 50% attenuation and an estimated 3.7% ABV. 10/03/2018: The gravity has dropped to 1.023 SG, 14 points away from the expected FG. The temperature has held at 67F, but I'm planning to raise it up tonight to 70F to help it finish out. 10/05/2018: The gravity is down to 1.009 SG. I've raised the temperature up to 72F to give it more help finishing up. I've seen momentary gravity readings between 1.010 and 1.008 SG over the last few hours so I suspect it's down near its final gravity (FG). 10/06/2018: The gravity is registering 1.008 SG today, a point below the expected final gravity. I turned off the temperature control, mostly to save energy, and will let the beer finish out at ambient temperature before treating with gelatin and cold-crashing it. 10/07/2018: The gravity is reading 1.009 SG today and has been holding steady now for a while. I'm planning to treat the beer with gelatin and cold-crash it before bottling next week. 10/09/2018: The gravity has continued to hold at 1.008-1.009 SG so fermentation appears to be over. As I write this entry, I'm blooming a teaspoon of gelatin in distilled water. I'll use that to clarify the beer while it cold-crashes in the mini-fridge. 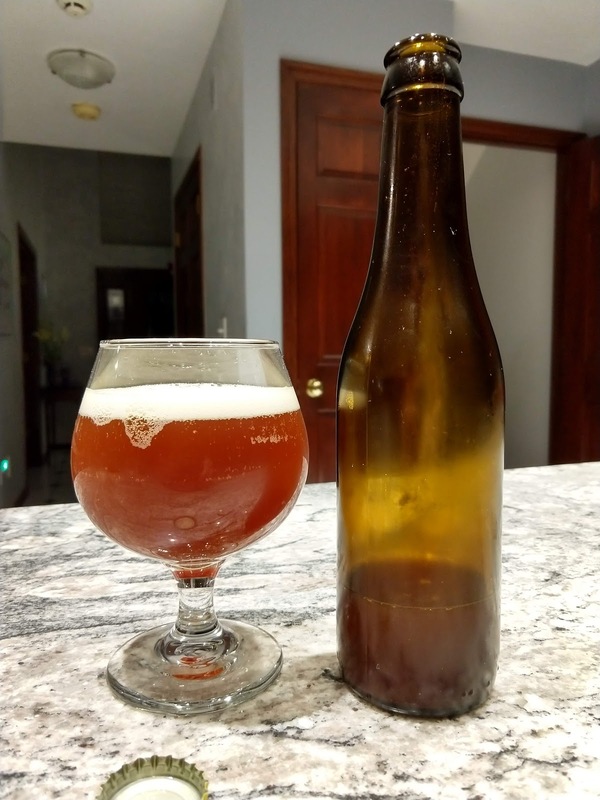 10/13/2018: The beer was bottled today with 4 small carbonation tablets per bottle. Yield was 25 bottles. A sample of the beer at bottling tasted much like any Brew Dog beer I've ever had, with a similar flavor profile and bitterness. A hint of mandarin orange flavor comes through in the middle. 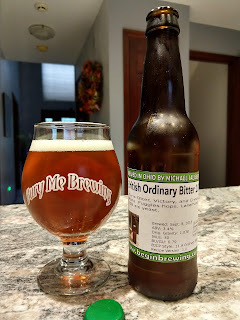 I've been trying to work out an Extra Strong Bitter (ESB) recipe for about a year now. My three previous versions did not do all that well with the judges who tried them, for differing reasons. Some felt I had the right bitterness but no "malt complexity" while others felt I had too much hop bitterness. A few even commented that there seemed to be "no hops" in the beer (the same version the two other judges felt had too much hops bitterness). For this fourth version, I've removed Victory Malt from the recipe. I've also removed the Caramel 10L that I used in the previous version. I've added Special B Malt into the mix, dialing back the Caramel 40L and Caramel 65-70L a little. I added some corn to give it some sweetness against the hops. I stuck with Lallemand ESB yeast for this version because I liked the two earlier iterations of this recipe that used it, and disliked the one that didn't. I also decided to go with East Kent Goldings in this version to see if I like it better in this style than I do in some others, but mixed in some Fuggles for a little complexity. Because my keg had run dry on a couple of recent patches and caused some foaming, I decided to increase the starting water on this batch to 3 gallons, 32 ounces. After the boil, the wort would be run through a counter flow chiller and into the fermenter. 09/16/2018: The extra water proved to be too much for this batch. Grain spilled up out of the mash compartment and into the boil compartment. I don't know if this will leach tannins into the beer or not. I'm hopeful it won't ruin the beer by making it astringent. The counter flow chiller worked reasonably well. I sterilized it by running the boiling wort through it for 60 seconds before turning on the cold water flow. Once cold water was running through the chiller, wort was coming out of it about 88F. Despite that, the temperature inside the fermenter was about 93F when all the wort was pumped in. I need to think about a better way to sterilize the chiller in future. Perhaps running boiling water through it before brewing. My fermenter developed a leak in the valve, which I didn't discover until I picked up the fermenter. I had to quickly sanitize some tubing and another fermenter, and transfer the wort into it. I'll deal with the leaky valve later. What was a bit irritating about this is that the valve didn't leak when I filled the fermenter with sanitizer earlier on... only when wort was pumped in. Gravity came up low on this batch, probably because of the extra water I added. In future I'll need to consider what the right amount of water should be. It apparently needs to be more than the recipe crafter suggests, but less than I used today. When I pitched the yeast, just before midnight, the wort temperature was registering at 83F. That's too high for the ESB yeast, but I'm hoping by the time fermentation gets underway it will cool down into a safe range for the yeast. Unfortunately, the only fermenter I had that would work with my temperature control system was the one that was leaking. I'll need to resolve that tomorrow night and perhaps transfer the wort once more. We'll see. 09/17/2018: About three hours after the Lallemand London ESB yeast was pitched into the wort, it began fermentation. At that point, the temperature was 78F. About 15 hours after it started reducing the gravity of the wort, it had reached a gravity of 1.020 SG. By then, the temperature had climbed to 80F. It's held at that gravity for about six hours as of this writing. That may the fastest fermentation I've ever experienced. I expected a sample of wort I took from the fermenter to taste and smell of acetone and other off flavors. I was pleasantly surprised to find that although I could pick up a hint of acetone, it wasn't easily picked up. The flavor seemed quite good, and the aroma fruity as is common for the style. I'm going to be curious to see if this tastes as good in the bottle. 09/18/2018: The gravity is now 1.019 SG. The temperature has dropped to 70F. Yesterday, the beer looked pretty cloudy. Today, it's looking quite a bit more clear. I'm hopeful that after cold-crashing and gelatin fining it will be bright and clear. 09/20/2018: The gravity has held at 1.019 SG, and the temperature is down to 69F. 09/22/2018: The gravity is down to 1.018 SG today (the expected target gravity), and the temperature increased slightly to 70F. I am planning to dose the beer with gelatin finings today and move it into the mini-fridge, once I remove the Ordinary Bitter which is currently in the fridge, and bottle it. 09/30/2018: The gravity held at 1.018 SG (not that I expected it to change during cold-crashing) and the temperature at bottling registered 37F. Yield was 24 twelve-ounce bottles. I put them in my "hot box" and set the temperature to 70F. Each bottle was loaded with 3 of the small Brewer's Best carbonation tablets, except for the last 3 bottles, which I primed with four tablets for comparison later. A sample of the beer from the bottom of the fermenter yielded a nice, slightly malt-forward flavor. 10/05/2018: I chilled a bottle of the beer and poured a glass. It has a nice coppery color and creamy head. The aroma is malty, but with a hint of butterscotch that is probably coming from diacetyl that the yeast needs to clean up. The flavor was mildly sweet with a good balancing hops bitterness. To my tastebuds, there was a nice malt complexity. I got some sweetness from the corn, a bit of caramel, a touch of dark fruit from the special B, and a nice medium body. I do think the hopping is a little flat, kind of a one-note song from the East Kent Goldings. Maybe adding a different English hop to the mix as the flavor addition, something like Bramling Cross or Sovereign, might add some variation that would kick the flavor up another notch. Still, I am very happy with this one as it is. 10/09/2018: The diacetyl is gone now. 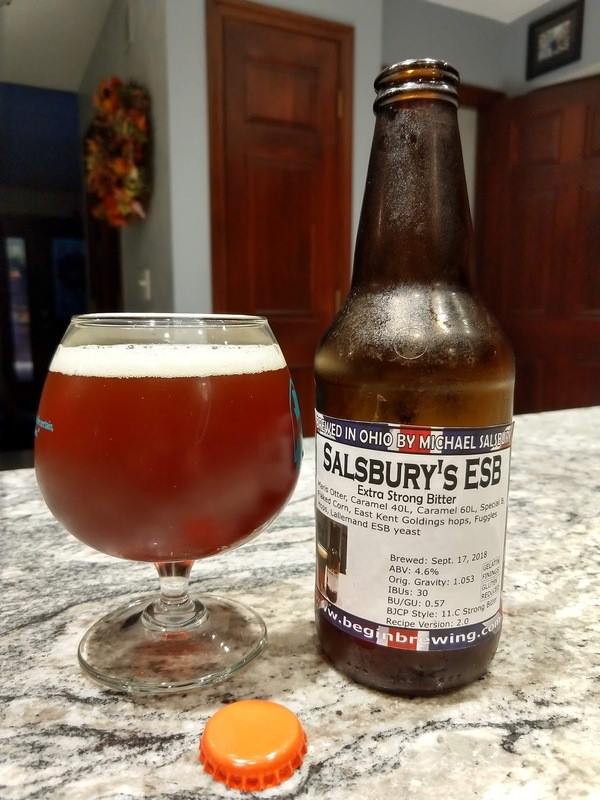 There's a little less sweetness to it, making it about the level of a Fuller's ESB from the UK, at least the bottles we find on shelves here in Ohio. The aroma is a mix of caramel and fruit, tending toward plum. The flavor starts malty with a balancing hop bitterness. Carbonation is low, but enough (as you see in the photo at the top of this post) to generate a thin beige head that lasts a little while before reincorporating into the beer. The fruit flavors in the beer had become more subdued to me, but are still detectable. Another style I've never brewed, but always wanted to, is the standard English Bitter. This is a low-alcohol, slightly bitter, session beer enjoyed in many British pubs. Mashing should be a bit higher than some styles, around 154F. I decided to go with Maris Otter, Victory Malt, and British Crystal 60-70L as my grist. I chose these in part because they're appropriate to the style, and in part because I happened to have all of them on-hand and wanted to use them up. I'll follow the recommendation to mash at 154F to have plenty of long-chain sugars in the beer to add body and sweetness to go with the hops bitterness. I chose Fuggles as my bittering, flavor, and aroma hop primarily because I'm not a huge fan of East Kent Goldings but still wanted a good British hop flavor. Fuggles is similar to East Kent Goldings, but is said to have a stronger aroma and less softness. I'm hoping it will make for a good finished bitter. I also happened to have Fuggles on hand that I hadn't used yet. I'm getting about 20 IBUs from the 60-minute addition and the rest from the 20-minute and 5-minute additions. For yeast, I wanted to get some of the fruity esters associated with the style. My experience with the Lallemand ESB yeast is that if fermented near the top of its range, it can produce subtle fruity esters. I'll use that yeast (since I happen to have it on-hand). To punch up the hop flavor a little, I'll add some gypsum to the mash water. I've also been using Brewtan B in my beers lately, so I'll use it in the mash and boil here as well, though I've seen the Brulosophy article suggesting it has little effect on flavor. I'll use Clarity Ferm because I have a friend who is sensitive to gluten and likes to have beer she can drink that's lower in gluten. To help the beer drop clear, I'm adding a beta glucan step in the mash to reduce that source of haze. I'm also including Super Irish Moss during the boil, and extending the boil to 90 minutes to (hopefully) help compensate for the lower temperature boil in the Zymatic. The Clarity Ferm may help reduce the haze a little, too. Right before bottling, I'll treat the beer with gelatin finings and cold-crash it for a few days. Hopefully this combination will yield a nice, bright beer. The 120F step was added to break up any beta glucans in the mash to help with haze reduction. (This is per a talk I listened to by Charlie Bamforth of UC Davis.) The normal High-Efficiency Mash step of 152F for 30 minutes was removed, and the step of 60 minutes at 154F was extended to 90 minutes. The 154F mash temp is a better match for the Ordinary Bitter style, based on reading I've done. Following the 90-minute boil, the Zymatic will pump the wort into the keg for chilling. As is my current practice, the wort will be pumped into a sanitized stainless steel kettle and chilled using a sanitized immersion chiller to a temperature below 80F before being poured into the fermenter. The Lallemand London ESB yeast strain reportedly works best between 65F and 72F. Toward the upper end of that range, it should produce the fruity esters common in many British Ordinary Bitters. For that reason, my plan is to ferment it just below the upper end of that range, at 70F. This has an added advantage of being very near my basement's current ambient temperature, so it should not require too much work from my temperature control system. There was a considerable amount of foaming early in the mash, starting during the Dough In step and continuing through the 120F rest. This did not result in the spillage of any wort outside the machine. The use of anti-foam agents didn't help a lot in this case. I checked the lines for air leaks and made sure there was water in the keg when the foaming occurred. In a couple of cases, there wasn't, so I added more and the foaming stopped briefly - but eventually reoccurred. 09/09/2018: The original gravity, according to my Tilt Hydrometer, initially read 1.040. After I got it setup with the BrewJacket temperature controller, it began registering 1.038 SG - which is the precise top end of the Ordinary Bitter gravity range in the BJCP criteria. I also found that I had more than 2.5 gallons of wort but less than 2.75 gallons (I have the fermenter marked in quart increments). The temperature of the wort at the time the yeast was pitched was 78F. The BrewJacket is configured to drop the temperature down to 69F for fermentation. I'm expecting it to get that low before the yeast begins doing much fermentation. The beer had a good color to it, about what I wanted to see. 09/10/2018: Gravity has dropped to 1.016 SG. The BrewJacket Immersion Pro has been holding the temperature steady at 69F. I'm hopeful that this temperature is low enough that the yeast doesn't produce an abundance of esters, but high enough that it produces some - consistent with the style. 09/11/2018: Gravity has been holding at 1.014 SG since approximately 4am today. I raised the temperature to 72F to see if this would encourage the yeast to take the beer the rest of the way to the expected final gravity of 1.012 SG. 09/12/2018: Gravity is continuing to hold at 1.014 SG despite the temperature increase. It's spent almost two days at 1.014 as of this writing. After three days at 1.014, I'll treat it with gelatin and move it to the mini-fridge to brighten up. 09/15/2018: It appears the the final gravity is holding steady at 1.014 SG, and has done so for over three days now. I treated the beer with a teaspoon of gelatin finings and moved it into my mini-fridge to cold crash and clarify over the next few days before bottling. 09/22/2018: The beer has now had seven days in the mini-fridge with gelatin finings and should be just about as clear as it can get at this point. I will bottle it with three small carbonation drops per 12-ounce bottle (low carbonation) today and move it into the "hot box" for carbonation. 09/29/2018: I chilled and opened a bottle of the beer (seen in the photo at the top of this post). It has a nice color. There is very little carbonation and a touch of diacetyl to it, which implies to me that bottle conditioning is still underway. The ESB yeast expressed its fruity flavors and aromas well. The balance tilts slightly (but only very slightly) toward the hops. Malt and yeast flavors come through well. I'll re-taste in a few days when conditioning has finished. Aroma (10/12): Mild malty aroma with a touch of caramel to it. Moderate fruitiness from the yeast, from the hops and/or yeast. No diacetyl in the aroma. Appearance (3/3): Coppery amber color. Very clear at serving temperature. Thin off-white head that dissipates in about a minute. Flavor (14/20): Moderate bitterness, maybe slightly astringent. Bitterness dominates at the start, then gives way to biscuity malt and a touch of fruit. A touch of caramel in the middle. Finish is relatively dry and bitter. There might be a hint of diacetyl, but it's barely noticeable. I'd like the fruit to come through more and maybe a hint of toffee, too. Mouthfeel (5/5): Medium-bodied, with low to medium carbonation. Overall Impression (7/10): I haven't had a true English bitter that I can recall, so it's hard for me to judge the style beyond the BJCP notes. In that sense, this beer hits the vast majority of them. It's primarily bitter but not intensely so. There is a malt, caramel, and fruit presence in the aroma and flavor, but this takes a back seat to the hops bitterness. Maybe adding a second hop to give some complexity to the bitterness would improve it, and perhaps shifting to a little more medium crystal malt might punch up the fruit element a little. Overall, though, it is an easy-drinking beer. My two previous attempts at cloning Coniston's Old Man Ale resulted in very tasty brews, but beers that had no real resemblance to the original. Both were extremely dark, nearly black in color, while Coniston's beer is a nice reddish brown. Both of my attempts tasted more (to me) like a Foreign Export Stout than a brown ale. I believe that's due to including too much roasted barley in the grist. This time around, I'm going with a little less than a third of an ounce in a 2.5 gallon batch. I'm hoping that will achieve the right color profile, and allow me to begin focusing on adjusting the flavor. The High-Efficiency mash schedule was used unmodified for this batch. This starts with a Dough-In step at 102F for 20 minutes, followed by a 30-minute step at 152F, a 60-minute step at 154F, and a Mash Out at 175F for 10 minutes. Wort is then extracted from the machine and heated to a boil. The plan is to free-ferment the beer in a plastic fermenter I have free at the moment. The S-04 yeast is said to produce some sourness at higher fermentation temperatures, which is a flavor element I remember in the real beer. It's intended to ferment between 59F and 68F. 09/02/2018: There was a fair amount of foaming on top of the step filter of the Zymatic during the Dough-In stage of the mash. Adding a few drops of anti-foam didn't seem to phase it. I wondered if maybe the keg had run dry, and it looked as though it might have. I added some additional water at that point but the foaming seemed to continue. After the Dough-In, the Zymatic lost its WiFi connection and appeared to re-run the last few minutes of the process before moving on to heat the wort to the first mash step at 152F. After brewing, the beer looked a bit lighter than I expected when I transferred it into a sanitized kettle for chilling. However, in the fermenter it looked much, much darker. I'm hopeful it will come out closer to the coppery color of the Coniston beer than my previous two versions. 09/03/2018: The temperature of the wort was still 75F by the time I was ready to crawl into bed, which is too high for the S-04 yeast, so I moved the fermenter into my mini-fridge to cool down overnight. This morning it was down to 51F. I put the wort into my BrewJacket temperature control system and set the temperature to 64F, in the middle of the yeast's optimum range. As of this moment, the temperature is up to 58F. 09/04/2018: The BrewJacket has held the temperature steady at 64F since not long after I pitched the yeast. I worried that the yeast was bad, as I saw no change in gravity for well over 12 hours. Before I went to bed at midnight, I checked on the beer and saw a thin krausen appearing on top of it, so I did not pitch more yeast. Today, the gravity has dropped from 1.053 SG down to 1.039 SG, with most of that drop having taken place between about 8:30pm yesterday and 5:45pm today. 09/05/2018: The temperature has been increased to the upper end of the yeast's range, 68F, to try to finish out the fermentation. The gravity is now 1.015 SG. This yeast has made slow but steady progress through the sugar so far, so it may yet get down to the expected 1.010 SG final gravity. We'll see. 09/06/2018: Gravity is 1,014 SG. I've unplugged the temperature control, but it's holding at 68F. 09/08/2018: Gravity has held steady long enough now that I believe fermentation has ceased. Since the beer I'm trying to replicate here is a slightly hazy brew, I'm not going to use gelatin finings on this batch. The original beer wasn't overly carbonated, so I'm planning to bottle this today using three small carbonation tablets per bottle ("low carbonation"). A sample of the beer taken from the last of the beer in the fermenter after bottling looked about the same color as I remember the real Old Man Ale looking when I last had it. The flavor had the same tartness that I remember from the real beer, combined with some nice caramel and toasted barley notes. I'm hopeful that it will compare well to a bottle of the real beer when I can find another. 09/14/2018: Below you see a bottle of my version (unlabeled, on left) and the Coniston version (labeled, on right). The color looks to be about right. My version has a caramel aroma (with a touch of diacetyl because it's not totally finished bottle conditioning). The flavor starts with a toasty malt, followed with a bit of caramel, and a hint of tartness. The stout-like roastiness I picked up in the two previous versions is not here, which is what I hoped for. In a week or so, I'll compare my version with my remaining bottle of the real beer and see how it tastes relative to Coniston's. My wife and I have also been doing a bit of "beer tourism" lately, too. We attended Brew Dog's "Annual General Mayhem" last weekend. We've visited Lineage Brewing, Platform Brewing, Zaftig, toured the local Budweiser plant (a rare opportunity), and more. So the time to brew (and interact with the good folks at PicoBrew) has been a little limited. 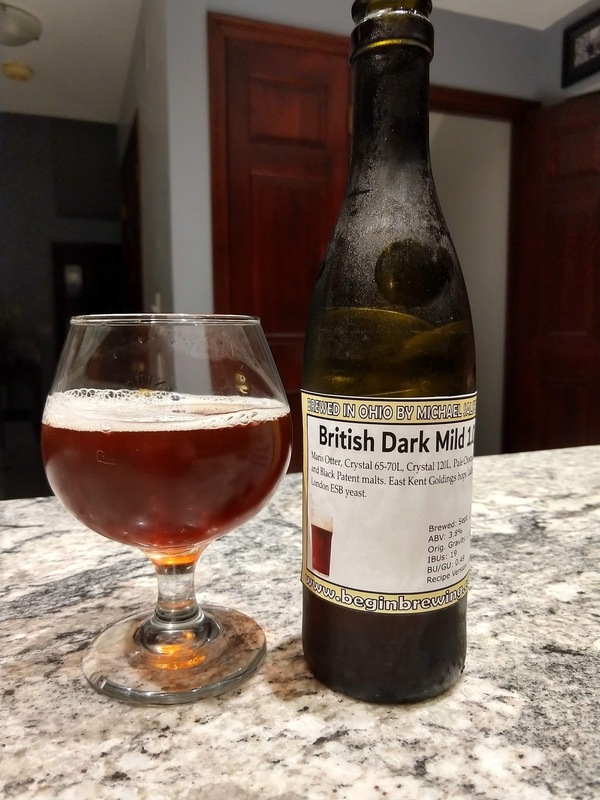 Why An English Dark Mild? It's been some time since I encountered an English Dark Mild on a beer menu anywhere. I loved the style the first time I had one. 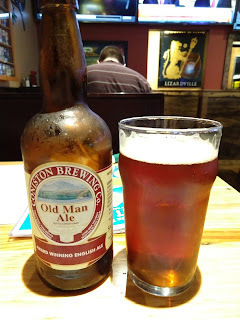 It was malty, smooth, and really easy to drink. Until today, I had never tried to brew one. Overall: It's a low-gravity, dark, malty session ale. Aroma: Malt aroma is low to moderate, possibly with fruity elements. Malt can be caramel, grainy, toasted, nutty, chocolatey, or lightly roasted. There is little or no hop aroma, but if any aroma is present, it should be earthy or floral. Appearance: Copper, mahogany, or dark brown. Low to moderate off-white head. Head retention may be poor. Flavor: Generally malty, with a wide range of malt and yeast-based flavors. It can finish sweet or dry. May have a roasted finish. Low to moderate bitterness, enough to provide balance but not enough to outshine the malt. Moderate to no fruity esters. Diacetyl low to none. Hop flavor low to none. Mouthfeel: Light to medium bodied. Low to medium-low carbonation. Ingredients: Pale British base malts, crystal malt, dark malts or dark sugar adjuncts, (optional) flaked maize, and may be colored with brewer's caramel. Characterful English yeast. Any type of hops, as their contribution is muted and rarely noticeable. 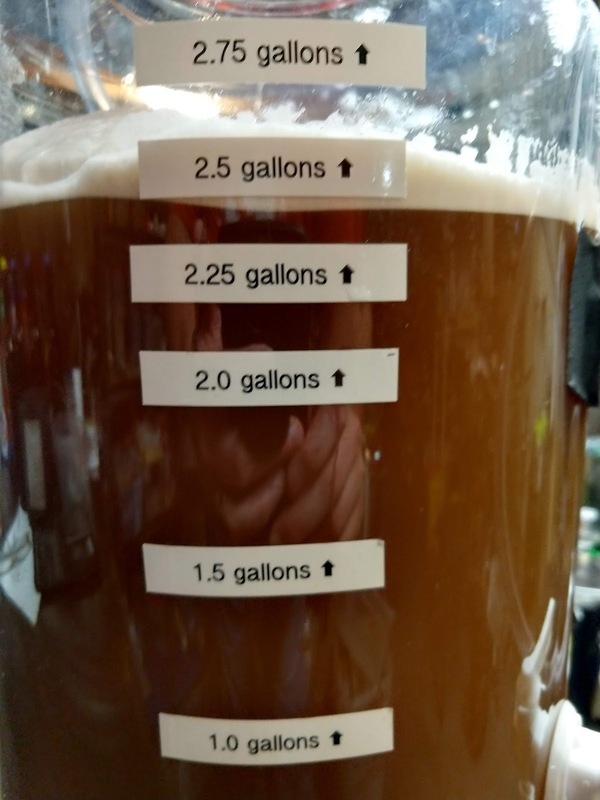 Generally, the beer ranges in gravity from 1.030-1.038 SG, with bitterness in the 10-25 IBU range, with a color in the 12-25 SRM range, and ABV 3.0-3.8%. In line with the BJCP guidelines, this recipe mixes Maris Otter base malt with caramel malt, pale chocolate, and black patent malt for color. East Kent Goldings hops are used at the start of the boil for bitterness, but not flavor or aroma, in line with the style. White Labs WLP002 English Ale yeast is used to ferment the wort. Following the boil, the wort is transferred to a sanitized stainless steel vessel in which a sanitized stainless immersion chiller is placed. Cold water flows through the sanitized chiller while the wort is stirred using the chiller and/or a sanitized stainless steel spoon. Once the wort is near room temperature, it's roughly poured into a sanitized fermenter to oxygenate it a bit before yeast is pitched. A sanitized Tilt Hydrometer is added, along with a half-vial of White Labs Clarity Ferm, and the yeast. The fermenter is then sealed and the BrewJacket temperature control system configured. The beer will ferment at the basement's ambient 68F temperature, which is in the optimum range for the WLP002 yeast, per White Labs. I'll then treat it with gelatin and cold-crash it in my mini-fridge until it drops clear. After that, it will be primed and bottle-conditioned until ready to serve. 09/01/2018: After chilling, I ended up with approximately 1.75 gallons of wort at 1.066 SG. I diluted the wort with a gallon of steam distilled water, down to a gravity of 1.039 SG and 2.75 gallons in volume. The color looked like I expected. I chilled the wort down to 73F. After pitching the yeast, adding the Clarity Ferm, and added a Tilt Hydrometer to monitor the gravity and temperature. 09/02/2018: About 18 hours after pitching, the wort's gravity was unchanged. Peeking inside the fermenter it was clear that fermentation was not happening. I pitched a second package of WLP002 yeast, one that is close to its expiration date, so it may not do well either. If there is no activity within 12 hours, I'll drop in a package of Lallemand's London ESB yeast, which should be a decent substitute for the WLP002. (Update, late in day) The yeast still did not come to life in the beer. The top of the wort was still and clear, with no hint of ongoing fermentation. At 9:30pm, I pitched a fresh packet of dry London ESB yeast to get fermentation going. 09/03/2018: The ESB yeast has gone like gangbusters. Starting around midnight, the gravity began to drop. By 11:30am today, the gravity had dropped to 1.020 SG. The temperature peaked around 75F, which is a few degrees outside the yeast's optimum range, but hopefully not enough to cause off-flavors. I strapped ice packs to it to start cooling it down within its ideal range, and soon had it there. After that, I strapped on my Cool Zone cooling jacket and pumped cool water through it to get and keep the wort near 68F, the ambient basement termperature and a good one for the ESB yeast. 09/04/2018: Gravity has held for a while now at 1.013 SG, and the temperature has held at 70F. I'm debating whether raising it to 72F (the yeast's upper end) would coax it to reach the expected final gravity of 1.010 SG. 09/06/2018: Gravity is down to 1.010 SG, and the temperature is holding at 70F. 09/08/2018: Gravity has held at 1.010 SG for a while, so I'm assuming primary fermentation is complete. I prepared gelatin finings and added them to the fermenter before moving it into my mini-fridge to cold-crash and brighten up before bottling. I plan to leave it chilling until next Monday evening, and bottle it then. 09/15/2018: The beer has now had a week in the mini-fridge with a gelatin addition for clarifying. Today I bottled the beer using 3 small carbonation tablets per bottle (low carbonation). 09/22/2018: A bottle was chilled and poured. The photo at the top of this post was taken. The color is a coppery brown with minimal carbonation and very little head. It's a little hazy. The beer's aroma is fruity and malty, primarily caramel in the malty portion of the aroma. A touch of diacetyl is present in the aroma. Flavor begins with a slightly grainy malt, a touch of toasted malt, and a hint of caramel. A touch of tartness makes an appearance as well. Finish is clean and slightly sweet. I think the next version needs to be mashed at a slightly higher temp, with perhaps a touch more caramel malt. The higher fermentation temp seems to have added a light tartness that isn't right for the style and possibly some yeasty notes to the aroma.